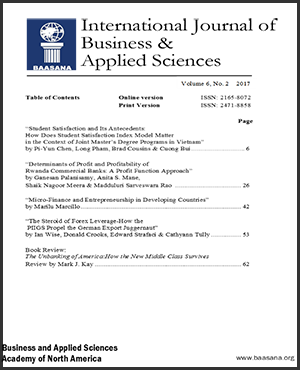 International Journal of Business & Applied Sciences (IJBAS) is an international double-blind peer reviewed journal published by Business and Applied Sciences Academy of North America (BAASANA) that provides guidance for those involved at all levels of business and applied sciences. The IJBAS is unique in a sense that it encourages interdisciplinary research and provides a platform for dialogue among researchers in general business and applied sciences. The journal publishes research papers, the results and analysis of which will have implications or relevance to policy makers and practitioners in relevant fields. 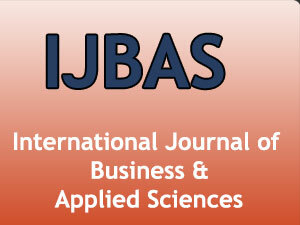 While IJBAS gives priority to empirical/analytical research papers, it also publishes original conceptual papers, review papers, case studies, and book reviews. Conference Theme: Applied Research— International and Interdisciplinary Perspectives. BAASANA is an interdisciplinary, not for profit, professional association of business, sciences and technology. It seeks dissemination of advanced knowledge and skills among scholars and practitioners of business and applied sciences toward resolving issues and problems of 21st century. By sharing knowledge, expertise, and facilitating transfer of know-how across digital divide we seek to contribute toward improvement of human conditions. Through scholarly, professional conferences, publication of peer reviewed proceedings, journals and expert panel discussions and making them freely and instantly accessible through the versatility of World Wide Web, BAASANA seeks to accomplish its mission. Annual membership dues are $50 for all practitioners and scholars of business, social, natural, behavioral sciences and technology.